At the last minute, I got tickets to see Circus Oz last night at the newly reopened Bass Concert Hall. 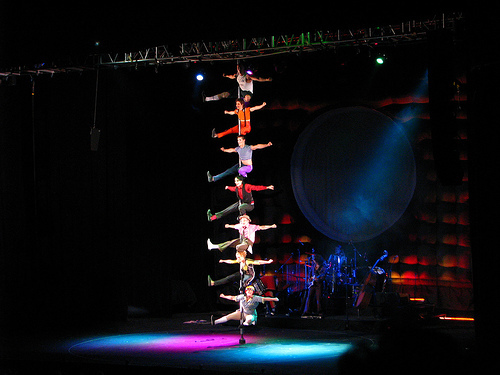 This is an Australian Circus, with all human performers. I didn’t know much about them nor did I know they were in town, but it turned out to be a great show. For their opening act, all of the performers together took part in some impressive stuff along this large metal pole going up to the ceiling. Going up and down in every imaginable way.. it was incredible. I mean, I’ve seen some pretty amazing feats centered around vertical metallic poles at several… uhm… venues, but this was above and beyond any of that. In fact they were so good that I’m pretty sure that even I wouldn’t be able to do it. At least on the first try. No, really, it was really cool. Compared to Cirque Du Soleil, which is the benchmark for fancy-schmantzy circuses in which there’s no risk of being peed on by a lion, Oz is a lot smaller in scale and the acts are less impressive. On the other hand, they aren’t nearly as pretentious, the music is better, they’re cooler (but not as cool as De La Guarda) and they try harder at humor. The humor part puzzled me though, because it was very simple, as if aimed at making little boys laugh (it worked)… yet it included some pretty off-color movements and poses (no, not during the metal pole act)… so there. Puzzling. I think I have always seen circus shows inside circus tents, I wonder how much the atmosphere changes at Bass. I wouldn’t put De La Guarda in the circus category, but I agree that they are awesome. I am still sore that none of us got to fly during that show.